Don't rush desensitization training, it takes time and patience. Fear is a primal emotion tied closely to survival instinct in humans as well as animals. If your new pup constantly cowers in the corner, it means he is afraid of something or someone. Unfamiliar sights and smells are enough to make even brave dogs a little nervous. Before you set out to solve your dog's fear problem, you need to identify the source of his anxiety. Loud sounds, such as thunder or the vacuum cleaner, are common sources of fear in the home. Some canines are a little shy around strange people or animals, so don't expect a new pet to warm up to everyone in the house right away. If you adopted him from a shelter, there's a possibility he was neglected or mistreated by a previous owner. Dogs can develop a profound mistrust of certain types of people, based on their previous experiences. However, most canine phobias are related to genetics and inexperience rather than abuse, according to Homeward Trails Animal Rescue. 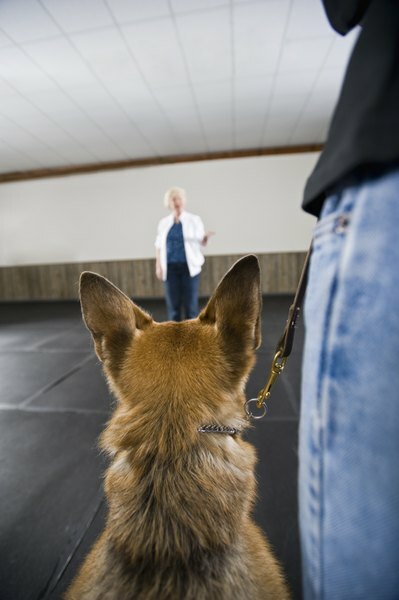 While your dog will have to learn to deal with the sources of his fear eventually, the first thing you should do when he shows signs of fear is to remove the perceived threat. Don't move the dog while she is attempting to hide or flee, because she may bite or act aggressively in self defense. Distract her from the source of her fear by enticing her with a treat or her favorite toy, according to the Humane Society of the United States. If you can take her mind off of her phobia, then you can move her out of the room and into a safe and quiet location. Your dog needs a personal space to retreat to when she is stressed, fearful or anxious. If she tends to flee toward a particular room, piece of furniture or her kennel, make sure she has a clear path toward that location at all times. Lay a blanket over her crate or create a dark, private space where she can escape from view. Don't crate her as punishment, because this generates negative association with her safety zone. If your dog is afraid of a particular object, you can help him overcome his phobia by exposing him to it on a regular and controlled basis. Place the object in a visible location that is out of reach, so he doesn't feel directly threatened by it. Move it around the house until your dog is comfortable enough to walk around the object. Move it into the room where you feed him for a few days, then place it directly next to the bowl. If your dog refuses to eat with the feared object nearby, then move it to another room and repeat the process for a few weeks, according to the British Columbia SPCA. Use an article of clothing belonging to the person the dog is afraid of to get him accustomed to that person's scent. Behavior modification is no simple task, so don't be afraid to consult with an expert. Pet behavioral specialists and dog trainers can help your dog get used to strangers and stressful social situations. They also can give you advice on how to deal with your pet's anxiety and fear at home. Your dog also may benefit from a trip to the vet. Anxiety and fear are often related to health issues, so it will be nearly impossible to modify your pet's behavior until you alleviate his pain. Be patient and give your dog lots of love throughout the process. Do Cat Trees Really Help Cats Stop Clawing the Furniture? Why Do Dogs Scoot on the Floor?